We are excited to announce the release of our newest solitaire game. This solitaire game is rather different from Pretty Good Solitaire, but we hope you'll find it as fun and addicting to play as we do. 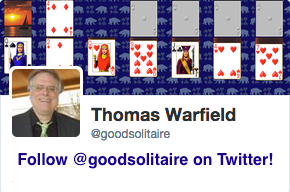 Our new game is called Action Solitaire. Action Solitaire is solitaire as an arcade game. Unlike regular solitaire, Action Solitaire is played for points against the clock in timed rounds. Action Solitaire has 22 different games. Play fast action games such as Triple Peaks, BlackJack Speed, and Picking Pairs. Play solitaire classics like FreeCell, Klondike, Spider, Pyramid, Golf, and Yukon, all like you have never seen them before. A Practice Mode lets you learn a game without the clock and your score won't count in the statistics. Action Solitaire uses the same card sets as Pretty Good Solitaire (if you have extra card sets installed for Pretty Good Solitaire, you can just copy the .dat card set files from the Pretty Good Solitaire to the Action Solitaire folder and you will then be able to select them in the Options menu in Action Solitaire). For super fast play, Action Solitaire can be played entirely with the keyboard. Great for extra speed or for laptops with slow mice. If you are a long time Pretty Good Solitaire player, it takes some time to get used to playing solitaire against a clock. But I find this game very fun. I suggest starting out with some of the simpler addition or tower games, such as Pyramid, Get 11, or Triple Towers. You need to note the scoring systems in each game, as that greatly affects your strategy (press F1 in each game for the rules, or click on the help button on the toolbar). Triple Peaks looks just like Triple Towers, for instance, but the scoring makes the best strategy very different. Similarly, the scoring system really affects how you play Picking Pairs. We have a discussion area for Action Solitaire on our discussion forum at <http://www.goodsol.net/forum>. Feel free to ask questions there or share strategies on how to win the games. We would also love to hear your suggestions for new games or features to add. The current version of Action Solitaire is beta version 0.90. This version of Action Solitaire is working very well, but we are calling it a beta because there is one big feature we still want to add. We want to add an online scores submission component, where you can submit your top scores to the web site. We think this is a very important feature for this game, since the whole object of the game is to get as high of a score as possible. Once you play a few games, you'll see why being able to compare your scores to others is important for Action Solitaire. While we have a score submission system for Pretty Good Solitaire, we want to make the submission of scores in Action Solitaire even better by making the scores lists update in real time, that is, right after you submit, rather than waiting for us to update the list every couple of weeks as we do with Pretty Good Solitaire. This is going to take some extra work and time, but we think it will be well worth it and make Action Solitaire a better game. While we are working on this new feature we will be updating Action Solitaire often, adding new games as we work on the online scores. When we have the online scores complete and working, then we'll do a version that will be version 1.0. In the meantime, Action Solitaire will keep all your scores. When version 1.0 is available, you'll be able to update to it and use the new online scores submission to submit your scores, even games you played in versions before version 1.0. And of course if you buy before version 1.0 is available, it will be a free update (as will all new versions to the end of 2005). And best of all, when we get the new online scores system working in Action Solitaire, we will then add it to Pretty Good Solitaire and Pretty Good MahJongg as well. I hope you find Action Solitaire as addicting as I do. It's been hard getting any work done around here because I keep playing it. The game has worked out so well that we plan to expand it significantly in the coming years, just as we did with Pretty Good Solitaire. Some games work better in the action format than others (addition type games and games like Golf seem the work the best), but there's obviously a lot potential to convert regular solitaire games over to this new way of playing. Give it a try and download Action Solitaire from <http://www.actionsol.com/download.html>. 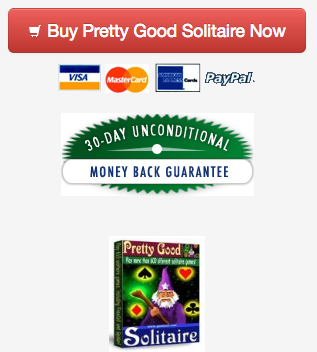 Pretty Good Solitaire, Action Solitaire, Pretty Good MahJongg, FreeCell Wizard, Spider Wizard, and more. Visit us at <http://www.goodsol.com>.